Being married and living in close proximity with another human being means that I sometimes come under close scrutiny. Not only are my good attributes admired, like my very straight nose or winsome smile, but my flaws are also held up to the light and dissected. “But I don’t want to change, love me as I am,” I protest. Especially when that behavior concerns kitchen etiquette. For instance, too many prep dishes used while cooking. Cabinet doors left dangerously open. An unholy profusion of spice jars. An ever-growing collection of measuring cups, no matter how pretty. Nothing to be found in its place. I threaten to stop cooking. I claim that the kitchen can have only one mistress. I blame my mother-in-law for the great, big mess that is my kitchen. Yet somewhere, one ear appears to be listening. Almost unnoticeably, the dishes start to become less. I heat the pan, chop simultaneously and throw things into the pot instead of mise en place. Kitchen shears are back in the allotted slot for next time. I wipe down the kitchen counter while I work. The peels previously scattered everywhere go into a “garbage bowl” a la Rachael Ray. I even wash the dishes that languish in the sink while my masterpiece bubbles on the stove. I also remember in a flash of inspiration, my sister who would gather the entire household to bake a cake. There would be one person beating the eggs, one chopping the butter, yet another measuring out the flour and so on, while she presided over the hubbub. A few months of culinary school later, gone were all the helpers. She worked in an empty kitchen, efficiently and alone. The quantities produced were large enough to feed a small army and the kitchen left spotless when it was all over. There’s no time for cooking school now, but cleanliness might bring me closer to chef-liness. And in the happy spirit of that, here is a recipe for Andhra green banana stir fry which tastes hearty, nourishing and very delicious with aromatic basmati ghee rice and spicy mango pickle. 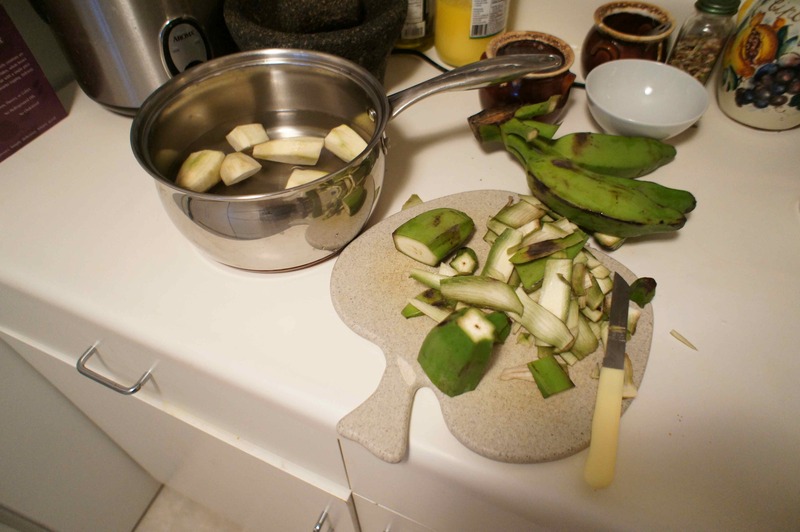 Peel and chop up about 8 medium green bananas (to serve 4) into 1/2 inch diced pieces and put into a bowl of water to prevent the pieces from turning black. Heat 3 tbsps of oil in a big pan and toss in the banana pieces. Fry for a few minutes, then add about about 1/2 – 1 cup of water and sprinkle salt over the bananas. Cover and cook on low heat until the bananas become soft. Stir occasionally to prevent the bananas from sticking to the bottom of the pan. The bananas should retain a firm texture yet be cooked through. Uncover and sprinkle chilli powder to taste. Cook uncovered for a few minutes. The bananas should appear a warm brown in color. 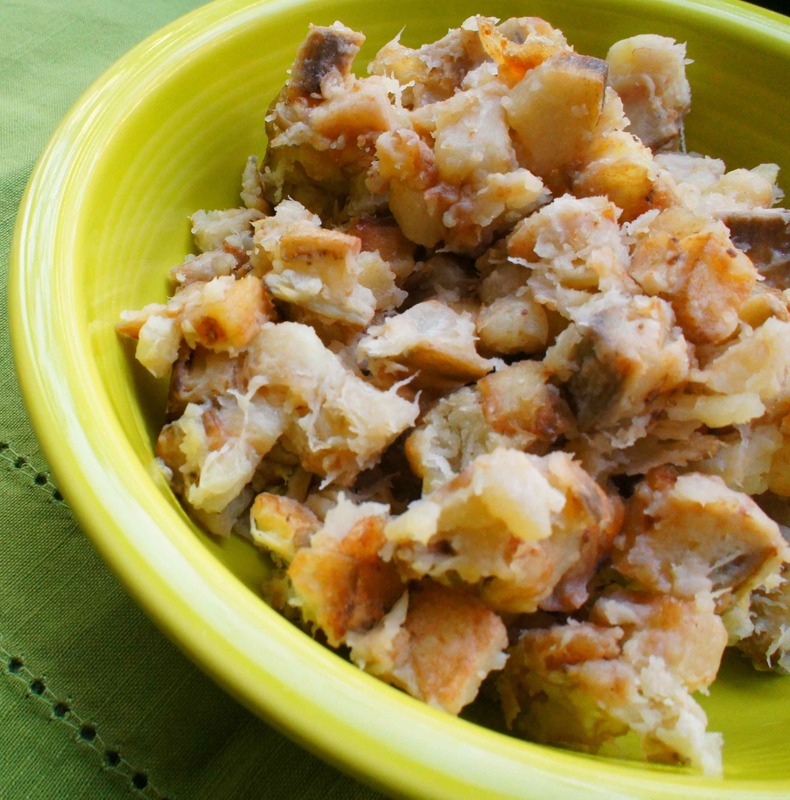 If serving later, reheat by tossing the bananas in a pan with a little oil to crisper the outer edges. Loved this one, especially the flaws. I am guilty of them all, and I also leave lids and caps open. 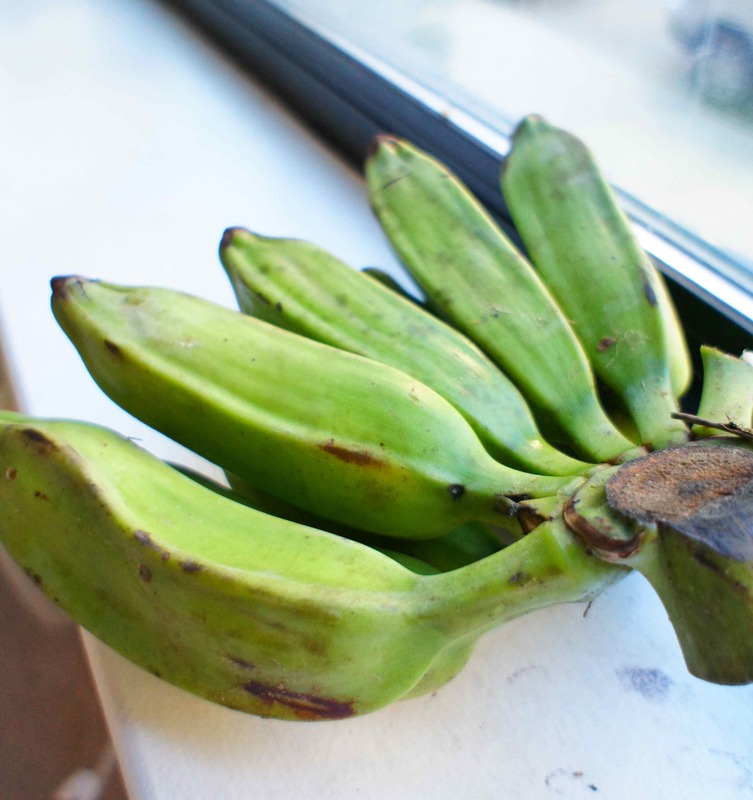 I used to peel the green bananas as well until my south Indian mom-in-law taught me to use the peeler and take out just a thin layer of the outer skin. Gave me a lot more quantity of subzi for the same amount of bananas.